Is America’s ‘Best Idea’ at Stake? Will Trump Change the Way Presidents Approach National Monuments? 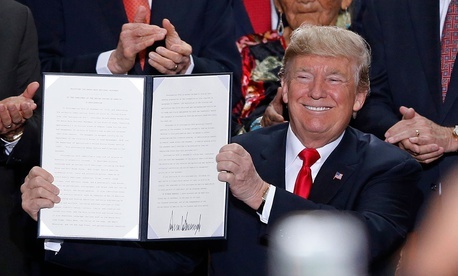 On Monday afternoon, President Trump signed two presidential proclamations that will reduce the boundaries of Bears Ears and Grand Staircase-Escalante, two national monuments located in Utah. Never before has a president reduced a national-monument designation made by a predecessor by such large margins. “I’ve come to Utah to take a very historic action, to reverse federal overreach and restore the rights of this land to your citizens,” President Trump told a crowd at the Utah State Capitol in Salt Lake City. According to leaked documents, Trump’s proposal would shrink the 1.32-billion-acre Bears Ears monument, designated by President Barack Obama in 2016, by about 85 percent. Grand Staircase-Escalante, which was designated by Bill Clinton in 1996, would be reduced by about 50 percent. Bears Ears has been a point of contention between Utah lawmakers and environmental groups ever since Obama designated it at the end of his presidency. Utah Senator Orrin Hatch has long been campaigning to reduce the size of the monuments, citing federal overreach as well as the possibility for economic development of the land. A few months after taking office, President Trump ordered Interior Secretary Ryan Zinke to review 27 national monuments. Zinke later suggested shrinking or modifying 10, including Bears Ears and Grand Staircase-Escalante. In his speech on Monday, Trump cited “past administrations” as having “severely abused the purpose and spirit and intent of a centuries-old law known as the Antiquities Act.” That act, signed in 1906 by Theodore Roosevelt, gives presidents the unilateral power to protect public land—but nowhere does it explicitly grant the president power to reduce or remove previous designations. On these grounds, several environmental groups have promised to bring lawsuits if Trump followed through on Zinke’s recommendations.